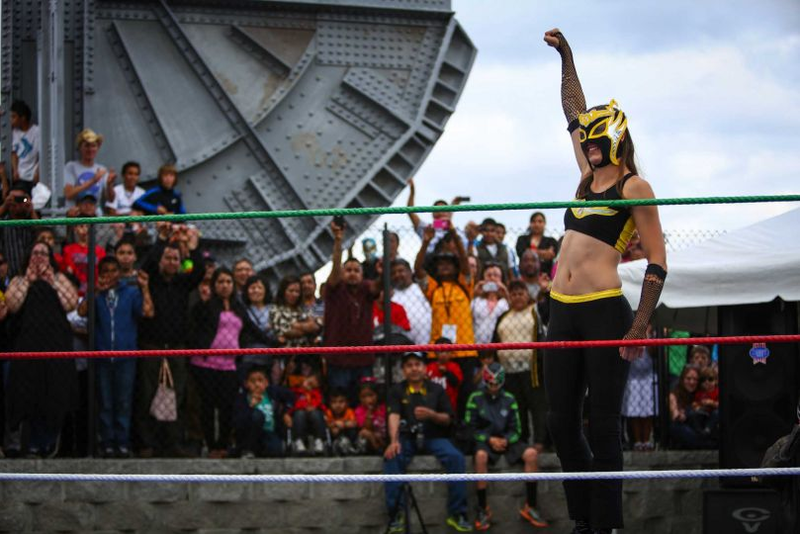 Recap: Lucha Libre at the Bridge | "Jump Higher!" Last Sunday marks the fourth (yes, the fourth) year in a row that Lucha Libre Volcánica has put on a summer show in South Park, Seattle. Despite the usual complement of technical hang-ups such as loose ropes and having the ring set up in a glorified gravel pit, the show was a huge success. The weather remained cooperative, and the audience showed up in droves. Hundreds of boisterous spectators packed in around the ring clamoring for a good vantage point, even going so far as to watch from over the edges of the newly inaugurated bridge. Audience members crowd the new bridge for a better view. This was my third year participating in this show, and my second year wrestling masked in South Park. This year Guerrero Águila and I took to the skies and kicked Faviola Astral and El Roughian to the metaphorical curb. We knocked their asses into gravel on various occasions, then locked them into a pair of perfectly-timed submission holds to clinch a win. On a side note, it was a dusty battle due to the afore-mentioned gravel pit venue, and I was still blowing fine black dirt out of my nose two days later. Oh well. Occupational hazard. If you were at the show you may have also noticed that I was sporting new headgear. Yes, after months of waiting, my open-topped mask finally arrived from Mexico! All of my masks up to this point have been of the standard closed-top variety, but when I visited Mexico City in January I requested a new mask. Then, much to my surprise, I was asked to helped create it. Miguel (who makes our masks and gear) did all of the heavy sewing work, but he put me in charge of the cutting and glueing. Now, back to Sunday. Wrestling with my hair outside of a mask was an entirely new experience for me. I always tie my hair up for practice so it is largely out of the way. No such luck with an open-topped mask. On the upside, now nobody will mistake me for a scrawny dude (yeah, it’s happened once or twice). The whole “hair flying in the wind” look when in motion is also a big plus. On the downside… logistics. But considering this show was the first time I had ever intentionally left my hair down to wrestle, it worked out swimmingly. In short, my new mask is fantastic, and I am exceptionally proud that I had some small hand in creating it. Exhibit A. Hair blowing in the wind. If you missed the show (shame on you), check out both Lucha Volcánica’s and my Facebook pages for shots of me and all your other favorite lucahdores! More photos should be trickling in over the next few days.